Owning a cat means becoming a slave in your home. Though cats do not demand too much attention, when they do, they need your absolute and complete attention or else you might suffer from a few minor scratches. Cats make great pets and excellent companions, especially if you are living in a small house or an apartment. The only tricky part about owning a cat is to change and clean its litter box consistently. On the plus side, some people understand our need for automatic litter boxes which help clean up the mess and thanks to them, there is hardly any stink left behind. Why buy an automatic/ self-cleaning cat litter box? Is it worth to invest in an automatic cat litter box? What to do when my cat doesn’t like its new litter box? To help you choose such a product, we present you the automatic cat litter box review which lists down the details of some of the best automatic cat litter box available in the market. Owning a furry friend can be a little high maintenance but trust us, it’s worth the shot. Bringing home an automatic cat litter boxcan solve many problems and provide a safe and healthy lifestyle. Wondering how does it help? The reasons given below will definitely change your mind. Starting with the benefit that it offers you, it can be easily said that they save a lot of time. It allows you to keep a pet even when you have a busy lifestyle. No more scooping cat litter several times a day. This job would be handled by the cat product you just brought home. These automatic boxes provide your cat a spot where it can dispose of its waste and come out feeling fresh. Confining the boundaries for your cat would minimize your contact with the waste and save you from the stinky smell and the daily litter scooping activity. Any possibility to come in contact with the cat litter germs would be reduced. It vastly improves your cat’s standard of living. Even if you own two to three cat pets, this luxurious cat product will help you provide them a lavish lifestyle. Your favorite pet is going to love it, want to bet on it? Do you own a single or multiple cats? What is the size of your cat? You need to buy a roomier box for your cat. Do you have sufficient budget to make this investment? Can you afford to purchase it along with other products? What type of automatic cat litter boxare you going to go for? Where do you plan on keeping the box? Is the place accessible for your cat? Does your cat visit the place more often? This litter box is great as you do not have to clean it for weeks. This self-cleaning litter box does not require you to scoop, clean, or refill the litter inside and ensure that the stink of the waste does not escape into the surrounding areas. It comes with crystal litter, which is known to absorb the cat's urine and the best part about this box is that it works five times better than any other litter when controlling the odor. The litter box comes with leak-proof disposable trays. These trays can simply be cleaned without causing you to get your hands dirty, or you can throw them away and use a new disposable tray. The fact that it is leak proof means that you will not witness any urine or waste slipping out of the tray. When your cat poops into the box, its automatic rakes will get to work and rake up the waste, which will then be transferred into a closed compartment to ensure that no stink escapes the box. This litter box is an advanced piece of technology as it comes with a health counter, which gives you the number of times that the cat has used the box. The automatic rake of the machine comes with an auto timer, which you can adjust to your likin. There are three different options available for you to choose from. There are safety sensors installed in the box as well, which ensure that the timings of the box are readjusted when your cat goes to use it again. There is a privacy hood added to the box which gives your cat a separate bathroom, which means that it can use it in peace. This feature also works to reduce the litter tracking after the cat is done using the box. For more efficiency, you can use the box with ScoopFree anti-tracking litter mat. If you are looking for a litter box that you do not have to clean for at least a month, then the ScoopFree litter box is the best self cleaning litter box that you can find. The litter box cleans itself for weeks to come, and you are not required to scoop the poop or clean or even refill the sand in the box. The box needs crystal litter which is known to absorb the cat urine quickly. It also dehydrates the poop, which means that there will be no stench coming from the box. The litter box comes with a hidden trap, which is designed in such a way that it blocks away from all the poop, which means that you will not be required to see, touch, or smell the waste. The tray of the litter box comes with a lid, which allows you to clean it up without getting your hands dirty. The tray is also leak proof and disposable, so once it has worn out, you can just throw it away and install a new one. You can even use ScoopFree anti-tracking litter mat for more effectiveness as it will ensure that the area surrounding the mat stays clean. This self-cleaning litter box is very easy to use and does not require the utilization of any electricity, liner, or filter. The grill of the litter box has been patented by the company and works to separate the waste and litter clumps from the clean litter. When you purchase the litter box, it will arrive disassembled, but be assured that the assembly process of the litter box is quite simple. All you have to do is follow the directions given in the instruction manual. The litter box is large and is good to use for multiple cats. The only downside of it is that it will need to be cleaned a little more regularly than other automatic litter boxes and will not control the odor too well. The litter box works by rolling onto its right side and then gets back into position. The cat waste will fall and be collected on the tray below the box. You can then pull out the tray and dispose of the dirty litter. This litter box is one of the best of its kind and significantly reduces the order of the waste thanks to the advanced technology used for the design. The plastic of the litter box is made up of such a material that it manages to absorb the odor and prevents the bacteria that cause the odor from growing. The best part of this litter box is that you are not required to clean it very often and when you are supposed to clean it, the process is straightforward and smooth as the surface of the litter box is non-stick, which prevents the litter from caking and reduces odor building and easy cleaning. Another one of the best self cleaning litter box, it is built to be extremely rugged and ideal for a person who owns more than one cat. The material of the litter box is durable and will not break easily, ensuring that its usefulness lasts for a long time. The box is also built with great metal gears which are used to clean the litter. The motor is yet another strong part of the litter box and ensures that the entire cleaning process is smooth and done properly. One of the great features of this product is that it does not allow litter to be wasted; the metal gears begin their work by separating the clumped litter from the fine grains and disposing of it in the attached compartment. The cleaning process of this litter box is silent, and you will not hear a sound from it. It is designed to make sure that the owner or cat does not get disturbed when the litter is being cleaned. The litter box is guaranteed to save you money as it comes with six plastic bags that you only need to touch when cleaning the litter, and that too will not make your hands dirty. You can simply disassemble the box as well and give it a proper cleaning every once in a while. These are the 6 best automatic cat litter box products that you can enjoy using. Bringing home any of the product would only result in providing you a scoop-free, comfortable and a playful life. Get it instantly and provide your cat a luxurious life. Are you not enough with litter box? Let dig further more with best cat litter mat. As a life-long cat lover, choosing the right cat litter box has always been my top priority since cat wastes can be so hard to control. Cat litter has done a great job at keeping the house clean and tidy. But it’s also dusty and dirty due to the scattered litter which was caused by our naughty cats. That’s why litter box is so important when it comes to dealing with this matter. A decent litter box can keep litter from falling out and make sure the surrounding environment is nice and clean. Automatic litter boxes are even cooler, they can separate the clumps from the litter, therefore, save us sometime instead of taking the litter out and scooping the wastes away. If you don’t have the time or just don’t want to do the cleaning job then an automatic litter box is what you should look for. It’s good for families who have 3 or more cats, you will never know how much clumps you have to take care of with this many felines. It’d be much better to have an automatic litter box. 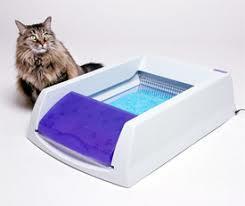 But if you only have 1 or 2 cats and your budget is not very high either, a simple litter tray is a much better choice. Stainless steel litter tray is better for you without requiring more works. It doesn't smell and easy to clean. The price is also very cheap. Sometimes, it might because your cat finds the old one perfectly fine and doesn’t want to spend the time to check out its new litter box. So what you need to do is put the old one away or throw it away if you don’t want to use it anymore. After place the old one away, you need to create some attractions to get your cat’s attention. Changing the litter might be an effective method since cats are often found excitement in new stuff as long as they’re cool enough. Choose the litter that you think that your cat will love, based on the smell, texture, and so on. Another way is to scoop all the remain litter (even the clumps) from your old litter box and pour them out in your new one. This is an effective method, it’s just a little bit dirty. Placing the new litter box right where you place the old one is also a good way. You cat will tend to go to this area in order to find a private place for its business. And the new litter box might be the perfect location for the job. You can place some toy on the door or place the condor next to it. The cat will find the nearest place when he feels like pooping. How can i buy this in country (Philippines), is it expensive to ship this?